The fifth edition of Kwani? Litfest, a gathering of writers, artists and thinkers from across Africa, takes place every two years happens in Nairobi, Kenya from 1st- 6th December 2015. This year’s festival with the theme, “Beyond the Map of English: Writers in conversation on Language” hosts readings, performances and discussions that explore issues of language and how this relates to African experiences and writing on the continent. The number of literary folks that have confirmed attendance in Nairobi include Nuruddin Farah, Taiye Selasi, Boris Boubacar Diop, Yvonne Adhiambo Owour, Wu Ming, Prof. Aldin Mutembei, FOKN Bois and Siphiwo Mahala. The Kwani? 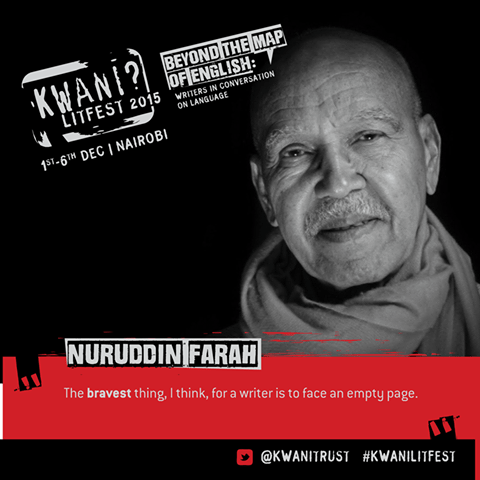 Litfest is a special occasion as it will be launching the East African edition of Nuruddin Farah’s book, Hiding in Plain Sight, a novel set in the wake of a terrorist attack that kills a Kenyan UN worker in Mogadishu, published by Kwani Trust. There are many other events shall be covered in the events including public lectures, symposia, concerts, book parties and other activities. The winners of the inaugural Mabati-Cornell Prize for Kiswahili Literature announced a few days ago will also be unveiled at the festival.